Last year I did interval training on the bicycle several times but the last time was last September. On that occasion I was then on a beta blocker and was clearly slower. I guess that was enough to discourage me from doing speedwork but today I decided to get going again. I repeated the same course I have done in the past so I could compare with my past workouts. It is a relatively flat course that included a couple miles of warm-up from our house and then a straight shot, with no need for stop signs or traffic lights during each of the 7 minute intervals. 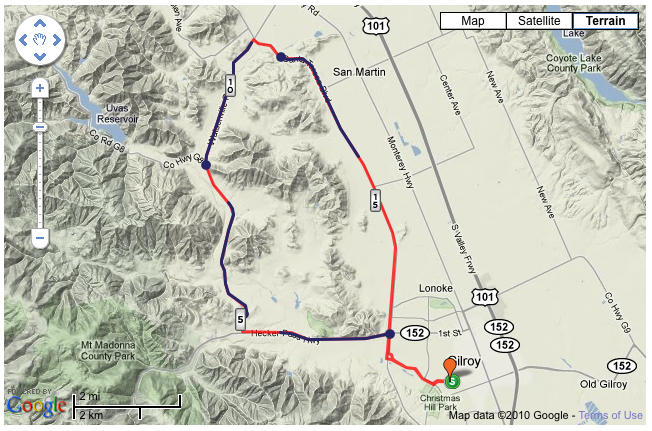 The blue sections on the map are the intervals done at speed and the red sections the recovery portions. From the map it would as if I could fit in a 5th interval at the end, but there are too many stop lights and I am way too tired to try a 5th one. It seems as if all I can do is ride the 4.5 miles back home. You can see the four intervals, followed by the recovery period from this heart rate curve. During the 7 minute interval I push as hard as I can and still hold the pace for 7 minutes. This was my heart rate curve for today’s workout. Ignoring the false reading during the warmup section, you can see in the above curve the four periods where I did the 7 minute speedwork. The affects of the beta block are significant when you look at the same curve below from only one year ago, when I was not yet taking the beta blocker. There is a much more pronounced heart rate buildup during the 7 minute interval sections. Using a circular course allows me to average the 4 segments so as to somewhat cancel the effect of the wind. This allows a comparison between different dates. I have data from ten workouts, the first in March 2008 and the 10th today. The last two were done while on a beta blocker and you can see the significant reduction in average heart rate and average speed. Update Note: For 2012 I have greatly simplified this process. See the new post for more information. Although many people keep track of the miles on their car and know when to take it in for an oil change, they often neglect keeping track of components on their bicycle, or they rely on a local bike shop to check it out. Using data from when I have had to replace components in the past, I can estimate the percent wear on each item. This is what it looks like. 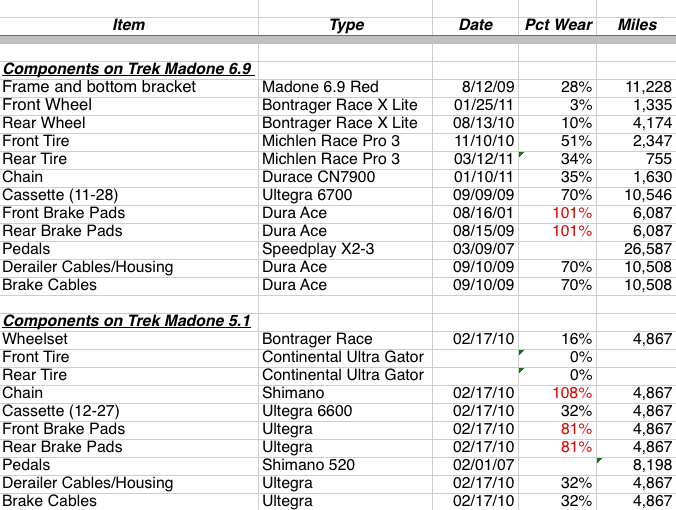 I check this periodically and noted I had better check the chain wear on my wife’s Trek Madone 5.1. Sure enough the chain checker tool showed wear to 0.75, which I use as a time to replace, so as soon as I finish this blog entry, I will go do that. For the tear wear, I keep track of how many miles the tire has been on the front and on the rear so I can estimate wear. I use a factor of 2X for rear wear compared with wear while on the front. It all might seem a big complicated, but after creating the training log, it is very easy to enter the daily workouts. Selecting a single drop down will allow me to choose that it was something my wife and I did together, only I did or only she did, and all the other numbers are automatically calculated from that. One other feature I added for this year was tracking which group I bike with, one of the 3 bike clubs I belong to, solo, or with someone in my family. This is what it looks like so far this year. Note that if my wife and I join a club ride together, that is where I count the miles so the “Family” category is just with someone in the family. Our time in Utah is more during the summer so that will change. 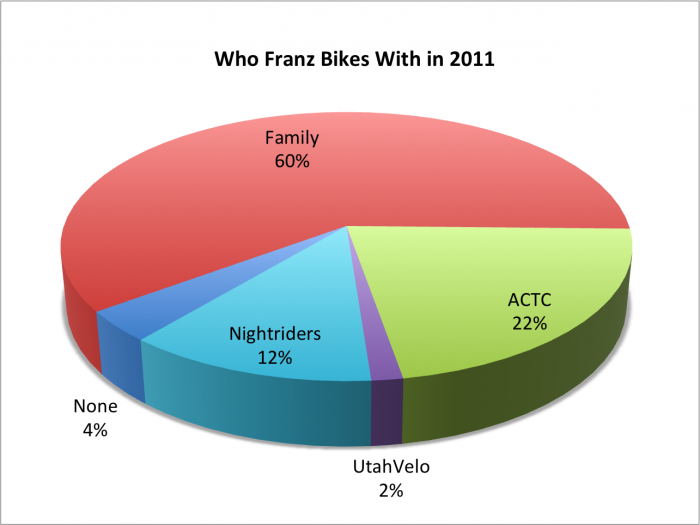 Biking with ACTC is not so common as it once was. These two examples are the type of information you can get if you keep your own training log. In my case it is really a training log for both myself and my wife and since most of our workouts are together, that makes things easy to track and also makes life a lot of fun. I can easily see how my running and cycling are doing compared with prior years. This shows how I did in 2010 compared with the prior years. I have friends who don’t even use a cyclometer to cycle with and have no idea how many miles they have ridden. But I also notice these same guys are always having some issue with cassette wear because they didn’t change their chain until it was too late. It might be the engineer in me that loves to see the data so I know how I am doing and how my bikes are doing. 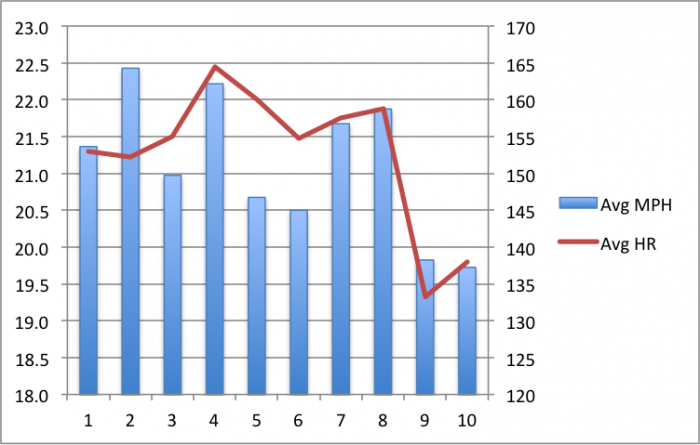 After looking at my training log at the end of last year, I wrote a blog post More Running and Less Biking. It was clear when I compared 2011 again prior years that I was pickup up more of the running I use to do and at the same time cutting back on cycling. We have traveled twice this year so far. In March we went to Utah where it was too cold to do much biking. Then in April we went back to Utah, and then a trip to Virginia and Atlanta. This type of travel, especially when the weather in Utah is cold, points out clearly the advantage of being able to run and not just cycle. Still the total amount of exercise is down and at the same time I seem to be going slower. There is no easy way to come up with an equivalent between sports, but I have developed a simple formula that attempts to convert all exercise I do into equivalent miles of running. I have use other formulas that are based on calories consumed or time exercising, and they have similar results. My goal has been to exercise the equivalent of 50 miles of running each week. After 19 weeks into the year that comes out to 950 miles. I was above that on prior years, but a bit short right now, averaging only 42 miles a week (equivalent running). As I do more running and less cycling, it is harder to get up to my goal, but I am still confident that I can get back on track. I hope to get the cycling up soon since we will be doing a 7 day cycling tour, Sierra to the Sea, starting from mid June.